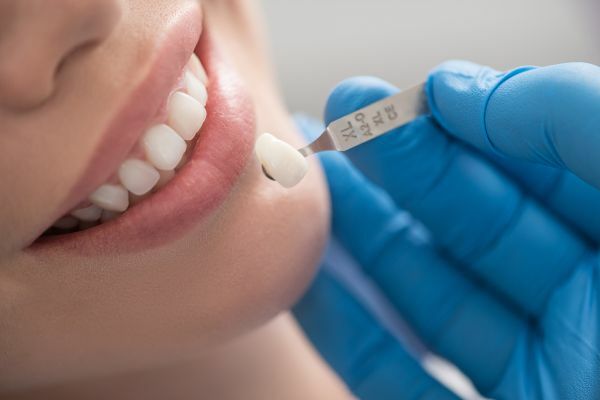 Dental veneers, also sometimes referred to as porcelain veneers are extremely thin shells that are custom built for people’s teeth to fix certain imperfections. These shells are also described as being " wafer thin" due to how extremely thin the device is that will be applied to the front of a person's teeth. What can I expect dental veneers to do? These custom built shells are built to be applied to a person's teeth to fix various imperfections that can make someone extremely self-conscious about their teeth when they smile. When someone decides that they want to have dental veneers applied, they will visit their dentist for the first visit and consultation. During this visit, the dentist will take the impression of the patient's teeth that will then be sent off to the lab to be built or built in the dentist's office. What issues do dental veneers fix? Teeth that are extremely discolored much more than can be remedied with teeth whitening procedures. Teeth that through the years have been worn down in different ways. Teeth that have been either broken or chipped and would take different procedures for each tooth to be separately fixed. Teeth which are misaligned or uneven, and also ones that are shaped irregularly and challenging to fix. How are dental veneers applied to a person's teeth? When someone decides to have the procedure and device applied to their teeth, they can expect to have three different trips to the dentist. If the dental office is considered a digital dentist office, it would require only one or two visits. A person will work with their dentist to set out the goals that the patient is expecting to receive when getting the dental veneers. During this appointment, the dentist will examine the teeth to ensure that dental veneers are the right procedure and that the device is right for that person. The dentist will take X-rays and most likely make an impression of the teeth that the dental veneers will be applied to. Once the dentist takes the impression, and the dental veneers are being made, the dentist will remove around half a millimeter of enamel from the surface of the teeth's surface. The amount that is being removed is around the thickness of the veneer that is being made. Before the dental veneer is cemented to the teeth, the dentist will most likely place a temporary veneer on the teeth while the permanent is being constructed. When visiting the dentist to have the veneer permanently placed, the dentist will remove and shape the teeth to be ready to have the veneers bonded to the teeth. Once the teeth and the dental veneer is ready to be placed, the dentist will use a special light beam that will activate the bonding cement. After the bonding cement is activated, any extra adhesive will be removed, and the dental veneers are complete. The dental veneers are fully applied, and you will have a follow-up visit in a few weeks to ensure that everything is working correctly. Have more questions about dental veneers? Contact us today! If you have any additional questions that weren’t answered here, contact us today! We will be glad to help in guiding you on making the best decisions for your teeth and oral health! « How Long Does Dental Bonding Last?